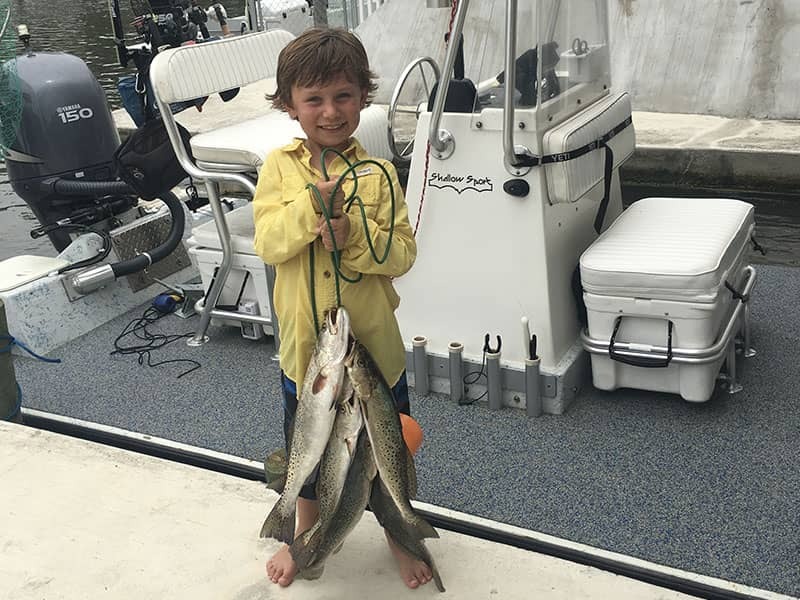 Here are some of our favorite fishing photos followed by our fishing tips. There isn’t a magic time to fish – sometimes they are there and sometimes they aren’t. 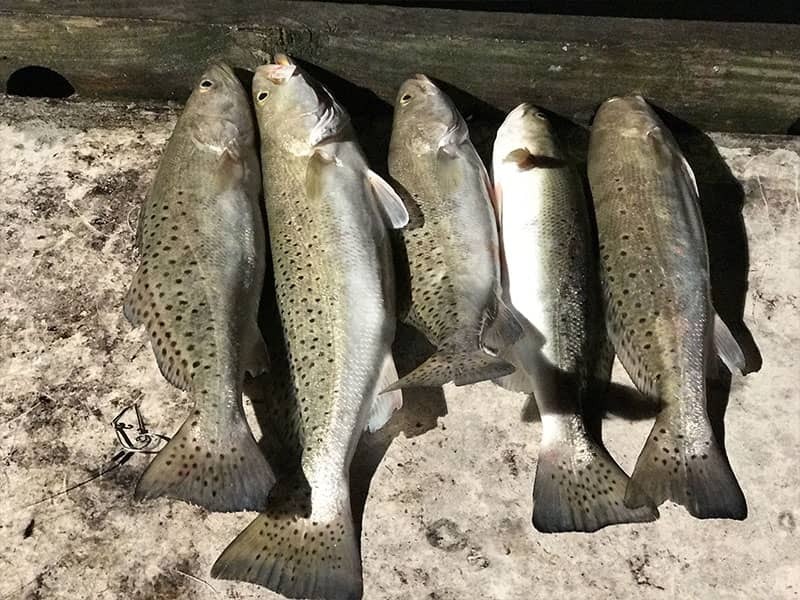 There are lots of fishing forecasts out there but I’ve caught tons of fish when the forecast is bad and none when the forecast is good. Sunrise and sunset are generally good and night time with the fishing lights. During the day, try wading, kayaking, and boating to find the fish. But I’ve caught keepers off the pier in the middle of the day as well. 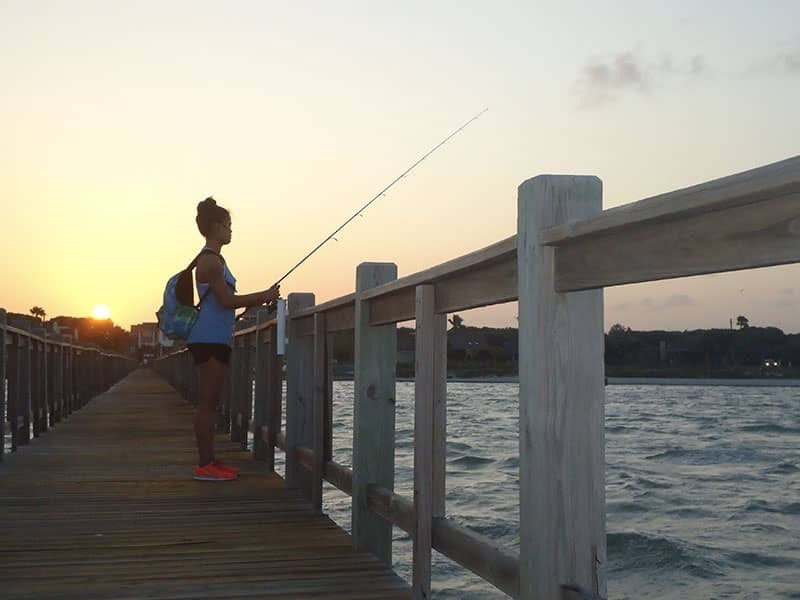 Do I need a fishing license to fish from a pier or dock? Yes. 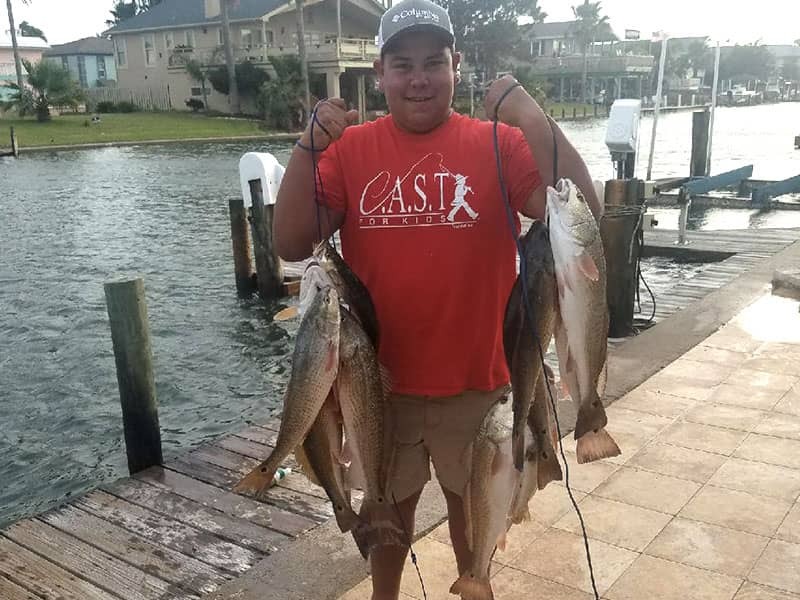 Everyone over 16 needs a saltwater license to fish in Texas. Exceptions are from banks within state parks and on free fishing day which is the first Saturday in June each year. You can purchase a license online or at various stores around town such as Tackle Town, Walmart, and some convenience stores. 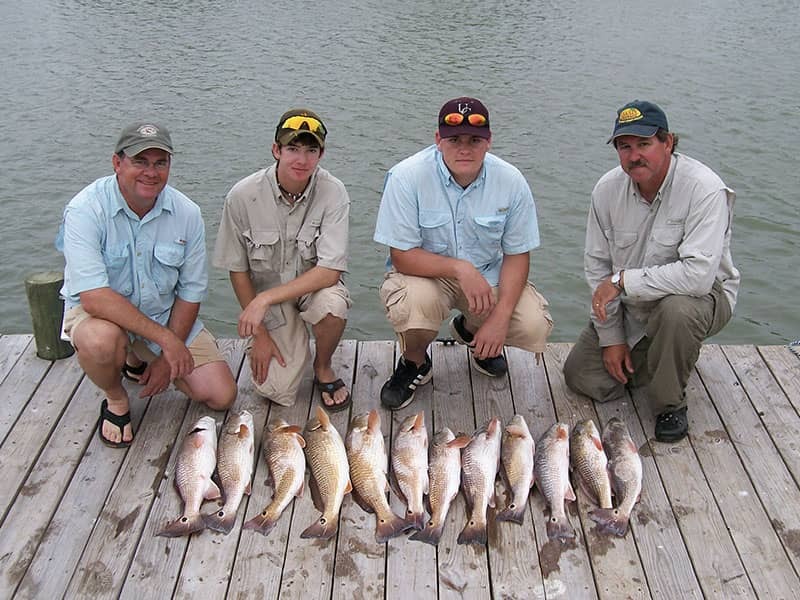 Click here for more information on fishing license. Click here to purchase a fishing license Make sure you know your size and bag limits as well. If you prefer live bait, the bait shops in Rockport and Fulton have fresh live shrimp most of the time. 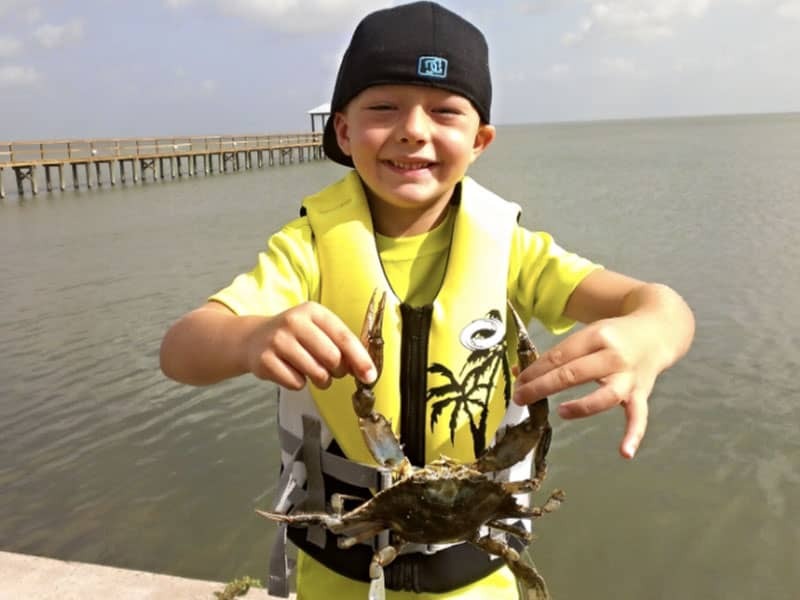 Finger mullet, croaker, pin fish, and crabs are seasonal. 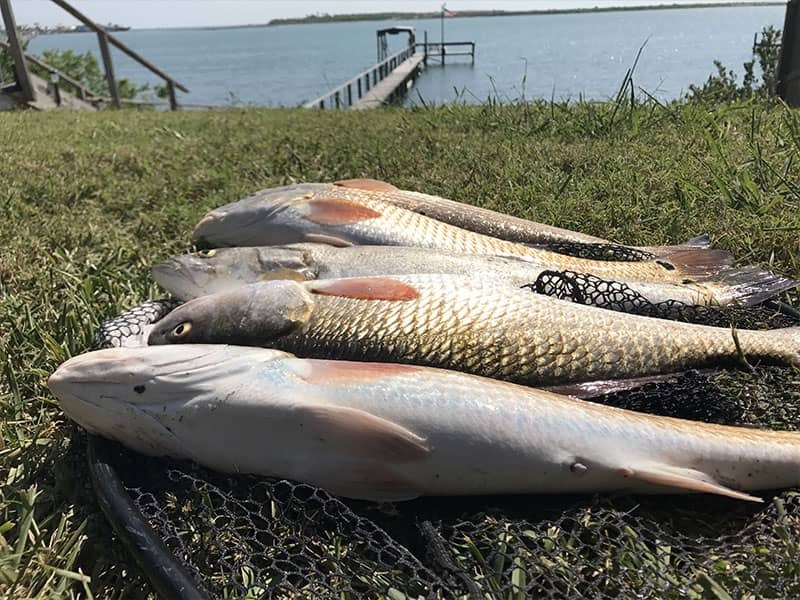 If you have a cast net, you can catch live bait from the bay. 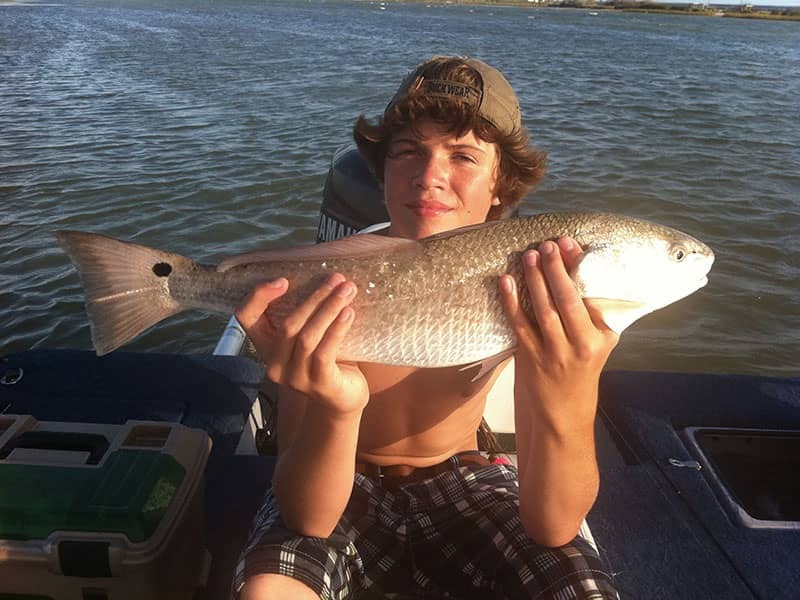 Small crabs are great for big reds and the other bait will catch everything. Be sure to get your bait early because they can sell out on busy weekends and not all the stands stay open late. When using dead bait, don't buy squid as it doesn't work in the bays (except for hard heads that eat anything). Dead shrimp work for everything and can be purchased at the bait stands. 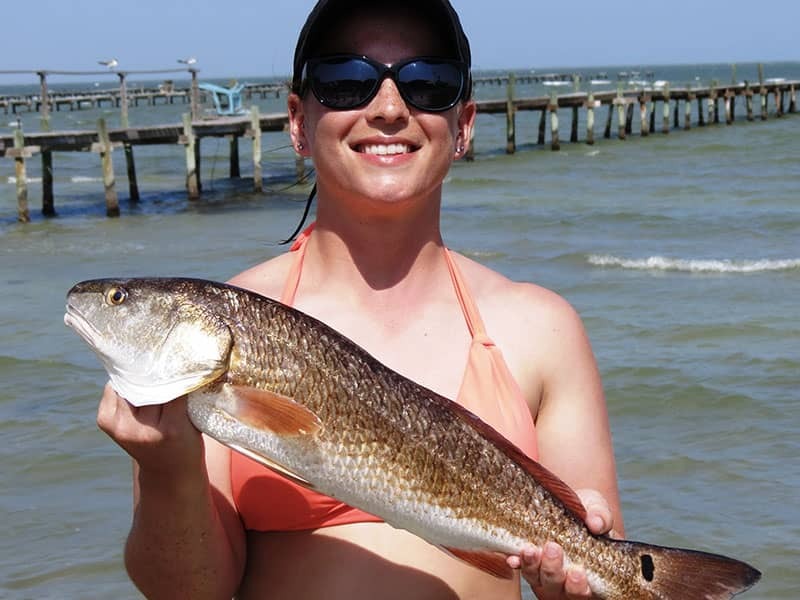 You can catch large reds using full size crabs cracked in half (no claws, no top shell). 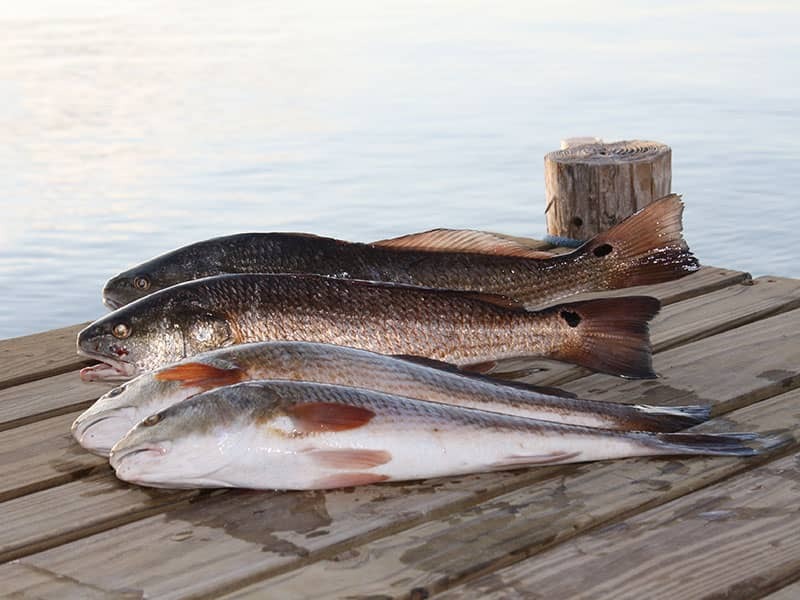 Dead mullet, croaker, pin fish, and cut bait catch black drum and redfish. 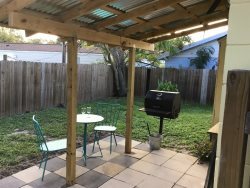 How should I set up my fishing pole for bait? For bobber fishing, use a 12-18" leader from the bottom of the bobber to your hook. Place weight in between the bobber and the hook if using one. Pop the cork occasionally to attract the fish. When fishing with cut bait on the bottom, use half ounce weight, swivel, and 18" leader to hook. I like to freeline live shrimp with a small weight about inches from the hook. What lures work well in the bays? Any freshwater bass lure will catch trout. Try Salt Water Assassins and Gulp. One of my personal favorite lures is the 3" Powerbait silver shad soft bait. At night, try assassins in pure white and black back, light belly and rig them weedless with work shank hooks. Spec rigs work well for trout, reds, and flounder. Bounce them off the bottom and under the piers for flounder. Speck rigs work well for reds and trout. Spoons and crank baits also catch reds and trout, and for a real rush you can't beat a top water plug. 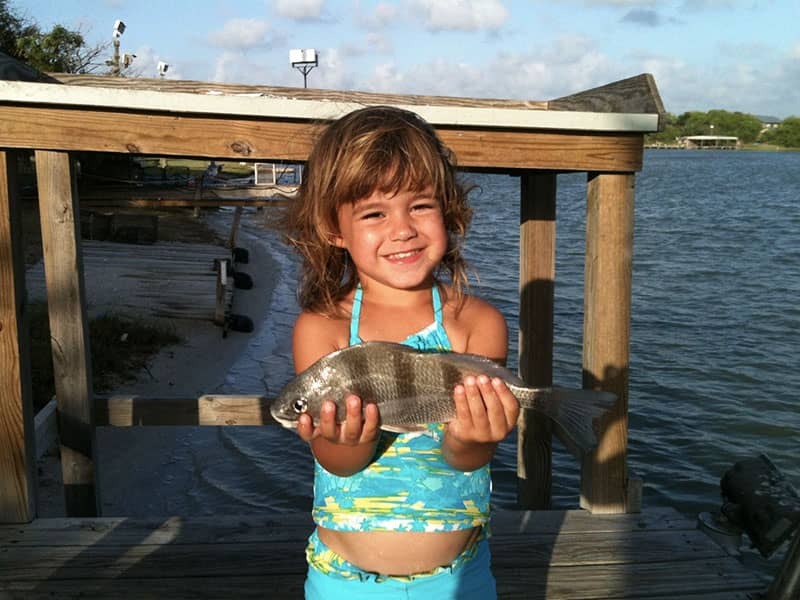 Fishing tackle and equipment can be purchases locally at Tackle Town, Walmart, and HEB. What kind of fishing line do I need? No need to use anything larger than 14 lb test monofilament line for bait fishing. 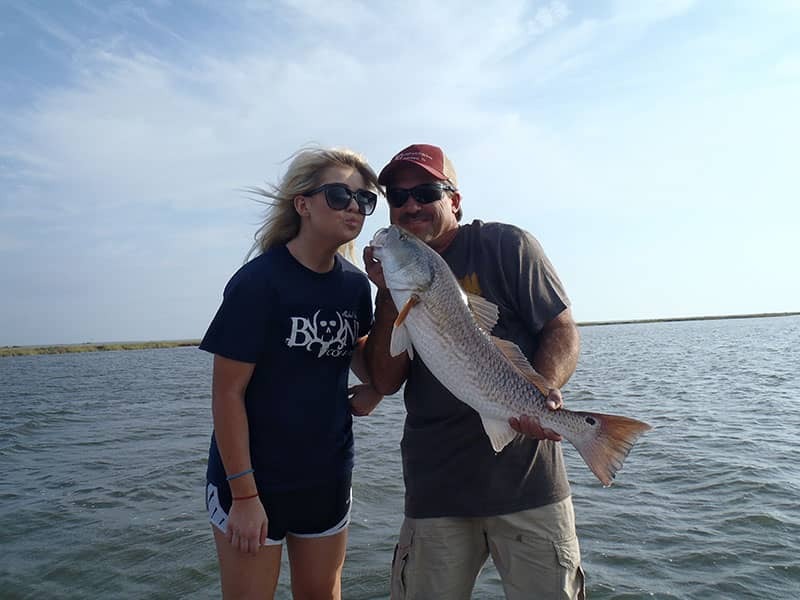 Most people use 10-12 lb test monofilament line for lure fishing as well as bait fishing. What if I catch a sting ray? Sting rays are very dangerous and painful. Please just cut your line if you catch one. Hard heads (they look like cat fish) also have a poison in their fins, so use hook outs when removing from the hook. Make sure to wash and use antiseptic on all cuts. If the cut is deep and caused by oyster shell please go to a doctor for antibiotics and stitches. Wading boots and sting ray guards are strongly suggested. There are lots of locations in the area to wade from shore as well as from your boat. It's a great way to explore the back lakes and shallow reefs that cover the area. It's also really cool catching 25 in reds in 8 in of water. 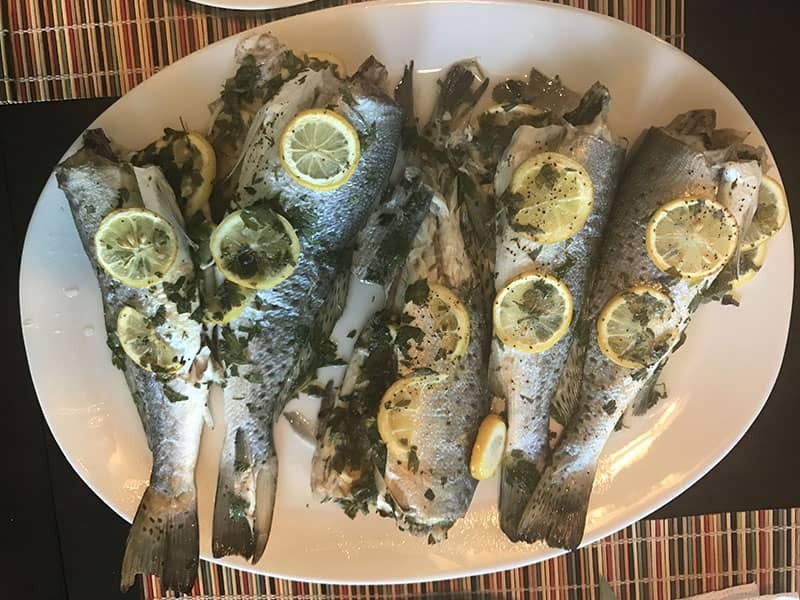 What are the size and bag limits for the fish I catch? What should I know about boating in the Rockport area bays? Safety first! Make sure your boat meets all coast guard requirements. There is a chance you will get stopped by parks and wildlife so, NO UNDER SIZE FISH!!!!! I suggest at least a top-o-map of the bays you will be fishing and a cell phone. These bays are very shallow and a GPS is extremely helpful in avoiding sandbars and oyster reefs. 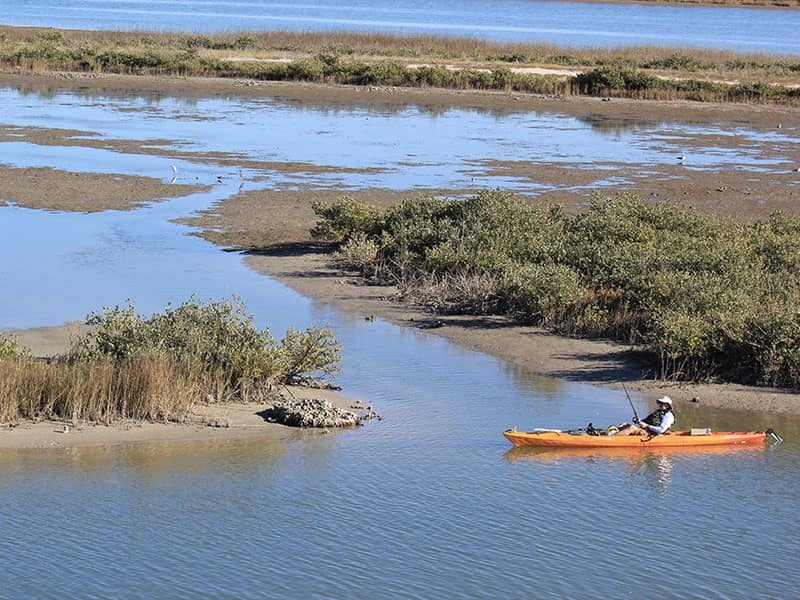 Kayaks are a great way to explore the shallows and there are lots of businesses in the area that rent kayaks and do guided trips. Sailing is also a great activity in Rockport because of the great prevailing southeast wind. I’m thinking about taking a guided fishing trip. How do I choose a guide? 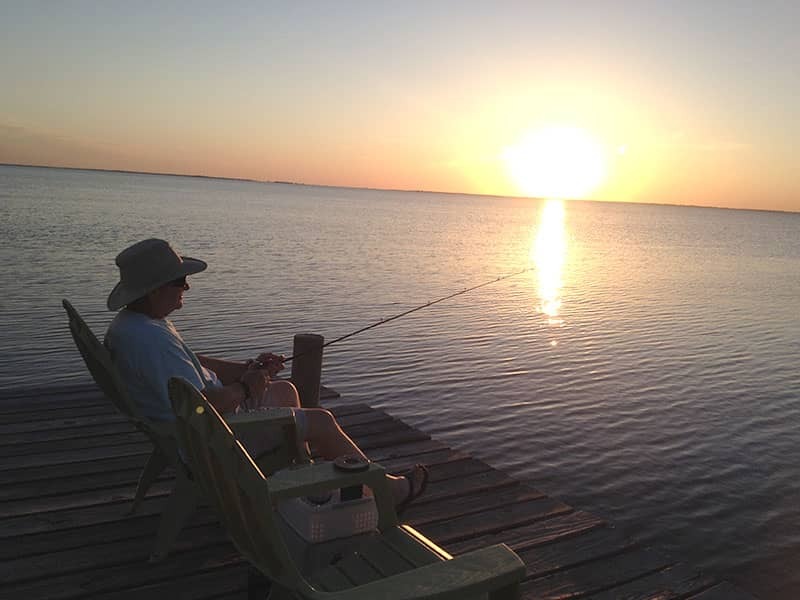 Rockport offers some of the finest fishing on the Texas gulf coast. 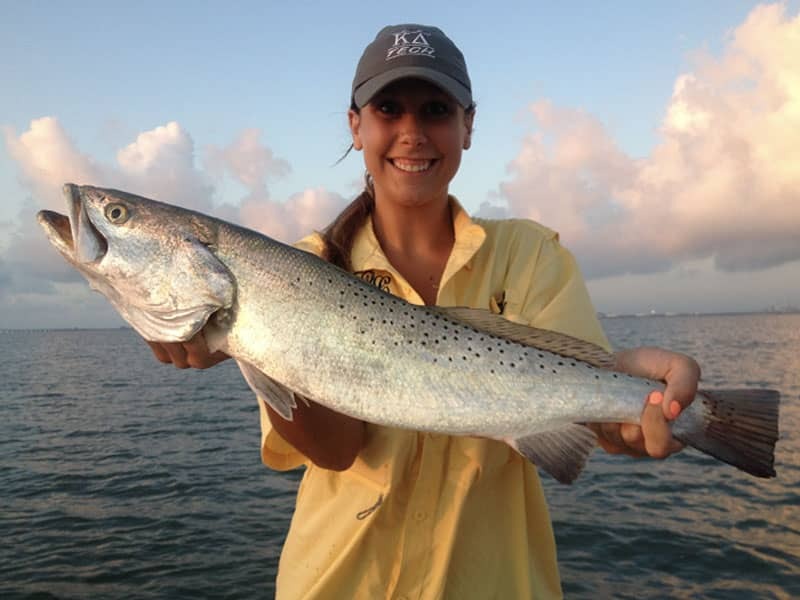 The many bays, lakes, and saltwater marshes provide an excellent habitat for a large number of game fish and water fowl. 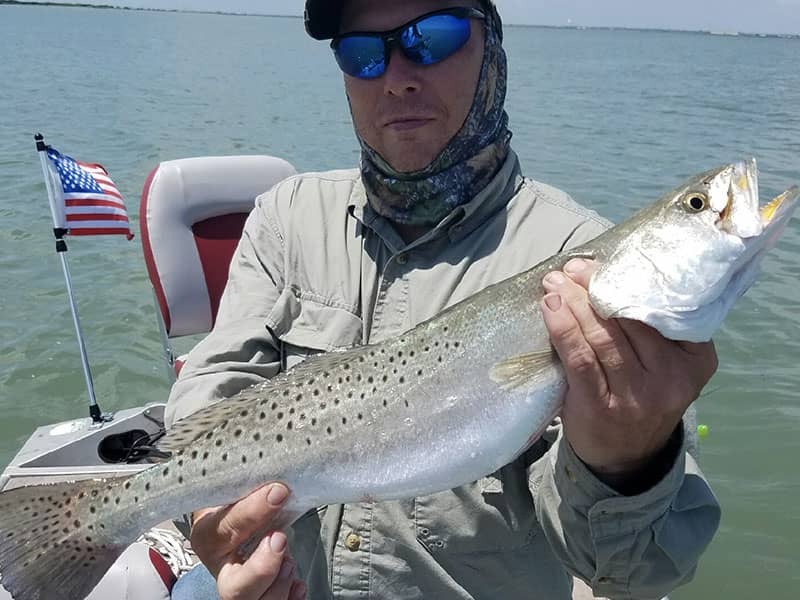 You will find many knowledgeable guides who specialize in wade fishing, fly, lure or bait fishing, kayak fishing, bay and offshore fishing, and hunting. 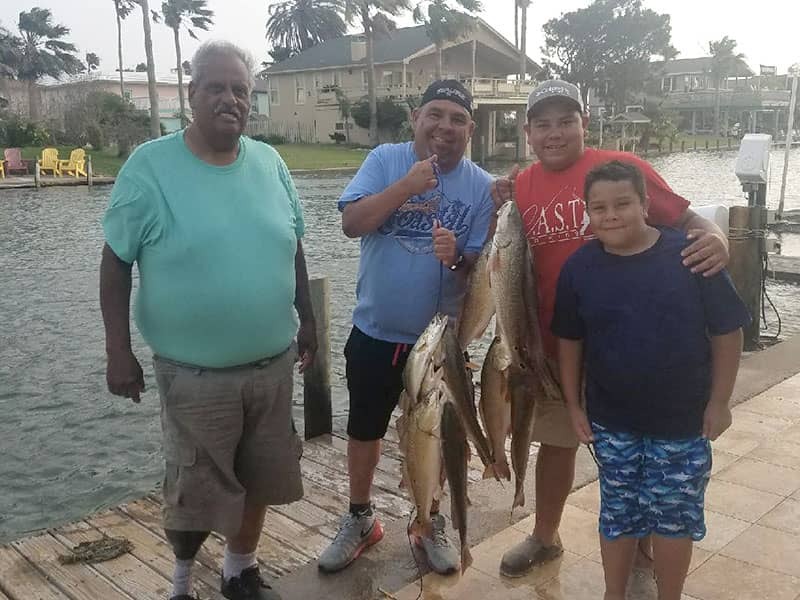 We have chosen some of the top guides in Rockport and the Coastal Bend area that are highly experienced and Coast Guard certified so that you and your guests can have a fun and successful fishing or hunting experience! We can also set up multiple guide trips for large groups. Book your trip directly through Miss Kitty’s for a no-hassle experience!